Salmon is a favorite of many and this Indian Spiced Salmon Over Wild Rice Medley recipe is a simple way to highlight a lovely piece of fish with a light seasoning of interesting and unique flavors from our Mumbai nut & spice mix. A touch of fennel, cumin and fenugreek season this flavorful fish in the perfect way. The result is not too strong – a subtle but interesting dusting of Indian spices adds just the right layer of seasoning. For the wild rice medley I added the gorgeous colors of heirloom carrots, however, if you have trouble finding this type of veggie, you can always use the typical orange variety. In addition, instead of using only wild rice, I combined a half and half mixture of wild rice and black rice, simply because I had both on hand and I wanted to see how both would work together. The result was great, especially since I cooked it in vegetable stock instead of just water for a bit of added flavor. Once you add the sauteéd red onion and carrots to your cooked rice, you’ve created a tasty and colorful bed for your salmon to sit upon. This Indian Spiced Salmon Over Wild Rice Medley makes such a pretty presentation, I think it would be a great meal to use for winter entertaining – especially if you are serving to a health conscious crowd. Enjoy! Heat a sauté pan, add a drizzle of olive oil, when the oil is heated, add the chopped red onion and chopped carrots. I try to chop both about the same size. I love to use the variety of carrots from heirlooms, however, if you cannot find these you can certainly use regular carrots. When they have softened and browned a bit (don't over cook because it's nice to have a bit of crunch in the vegetables), remove from heat and allow them to cool a bit. Add the carrot/onion mixture into a large bowl with the cooked rice. Concerning the rice, I used a mixture of half black rice and half wild rice simply because I had both however, you can use just wild rice. I always cook my rice in vegetable or chicken stock instead of just water and add a pinch of salt - this adds a great flavor to your rice. To the rice, toss in the chopped parsley and 2 tablespoons of the dressing. Toss together and set this aside as your base for the baked salmon. Heat the oven to 450°. Slice the salmon into individual servings and pat it dry with a paper towel (this helps crisp the skin side. Drizzle the salmon with a bit of olive oil and rub the top and bottom with your hands so it is lightly coated. 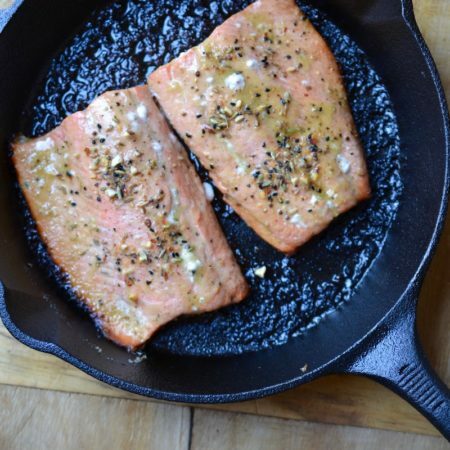 Using a cast iron pan, heat it through on a stove top, add a bit of olive oil, then place the salmon, skin side down, into the hot pan and let it brown the skin for a few minutes. Generously sprinkle the top with Mumbai nut & spice mix and place the hot pan into the oven for about 10 minutes to cook the salmon through. 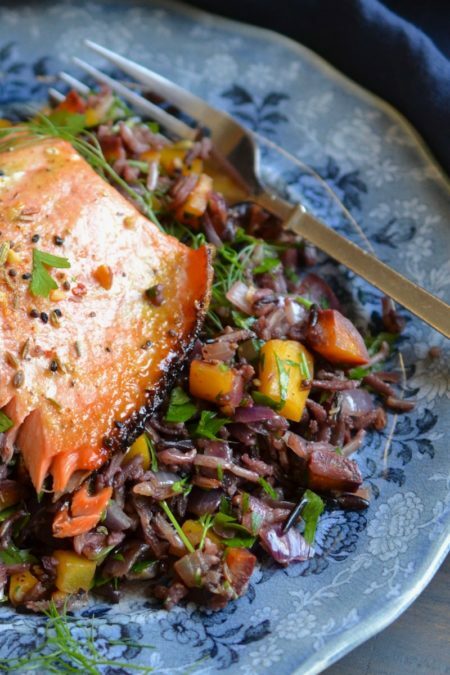 Remove the salmon from the oven and place it over a bed of the wild rice medley. Drizzle the tops of each salmon with the dressing and drizzle any remaining dressing onto a bit of the rice medley. Garnish with a bit of fresh herbs (in the photo I used fennel fronds, but if you have any leftover parsley leaves this would work well too) and serve immediately.